I don’t want to alarm you or, certainly not, insult you either. But, you may be doing it all wrong! It’s great you are in the kitchen preparing healthy meals for you and your family, but you may be taking some incorrect measures or incorporating methods of cooking that nullifies all your good efforts. Yes, it’s true. The preparation and cooking methods you choose may alter its nutritional content. You may be reducing the antioxidants, fiber and even switching around the make-up of all those good-for-you foods! So, let’s find out how to fix all that! 1. Let it rest. Although many do chew raw garlic for its abundant health properties (see here), that is going a bit far for my taste buds. To get the biggest health boost from garlic when cooking, mince it, slice it or press it, and then let it rest for 10 minutes. This allows the allicin, the main healing ingredient in garlic, to formulate. If you rush it by mincing it and throwing it in the hot pot right away, you expose the garlic to heat and destroy all the magic. Remember 10 little minutes. 2. Slice the right bulb. Sweet onions are sweet all the way around and are a healthy choice, but they don’t carry quite the health punch as the more robust red and yellow ones (see here). Keep the sweet to raw preparations like salads, sandwiches, etc. and make sure you peel the pungent onion varieties to get those stews and soups started or to make anything cooked. Remember: Stronger onions means stronger powers. 3. No longer than 5. To retain the most vitamins for those nutrient-dense cruciferous vegetables like broccoli and cauliflower, don’t cook them very long, studies show. Keep these vegetables in uniform, smaller pieces and steam them for 5 minutes and add spices for flavor. Yes, steamed vegetables can be a snoozer, but adding your favorite spices, fresh herbs and oils to season them, will both enhance the flavor and their cancer-fighting nutrients. Here are some great examples of just how to do that. Try a pan saute as a quick steam technique as well using a bit of water and no oil. It works great for snap peas, greens and other quick-cooking vegetables (low calorie too). If you choose to stir-fry or roast, keep the cooking time short as well. Remember Shorter cooking, longer life. 4. Create the right smoke. Don’t burn your dish by choosing a cooking oil with the correct smoke-point for the temperature you are using. Check out my post on oil choices, smoke points and which oils are best to use for certain types of cooking here. Oils that contain high smoke points are healthier to cook with and do not ruin your dish by allowing it to burn. So, leave your expensive extra virgin olive oil (with a lower smoke point) for raw salads and non-cooked foods where you can really appreciate the flavor of it, too, and choose an avocado oil (with a high smoke point) for a more intense heat cooking method like a stir-fry. Remember hot pan, right oil. 5. Keepin’ the skin. Many of the nutrients in vegetables and fruits like apples, potatoes, and carrots are found in or just under the skin. When we remove the peel, we strip that away. Look here for great details on that. If possible, try and scrub them clean and cook leaving the skin on. If you must peel them, try to just take a thin layer. Mashed potatoes that I steam using the Yukon Gold variety work great for me with the peels left on (less work, too!) Remember outer layers, inner goodness. Tell us, do you have a favorite tip to throw in when it comes to getting the most out of your healthy cooking? Please share! Make sure you are seasoning your dishes with the healthiest of salts. Try sprinkling this one on your creations in the kitchen for better mineral levels and more. Try to eat greens every day . . . or almost. Here are 6 to try and lots of ways to make them taste great, too! Fantastic that you learned something new, Jenny! Thanks for putting this post together. I use garlic every day and I never knew about the 10 minute rule! So very happy I could help, Joanna! Thanks for coming by. Thanks Mary Beth! Happy cooking! I refrain from cooking fruit. I think fruit should be best eaten RAW. Interesting! Love to learn new things. Any particular reason? Thanks for commenting! Please read my post Well-Oiled as it goes into greater depth on the topic. So glad you came by. Great post! I had no idea to let my garlic rest. Neat little tidbit! Thanks for stopping by! Oh wow! I pick the sweet onion for everything! It's the Southerner in me. Thanks for the useful tip. I'll try switching it up more often. I love sweet onions, too, Julie. But, the other varieties are wonderful, too, and lend themselves better to heated dishes along with providing some great nutrition. Thanks so much for stopping by! 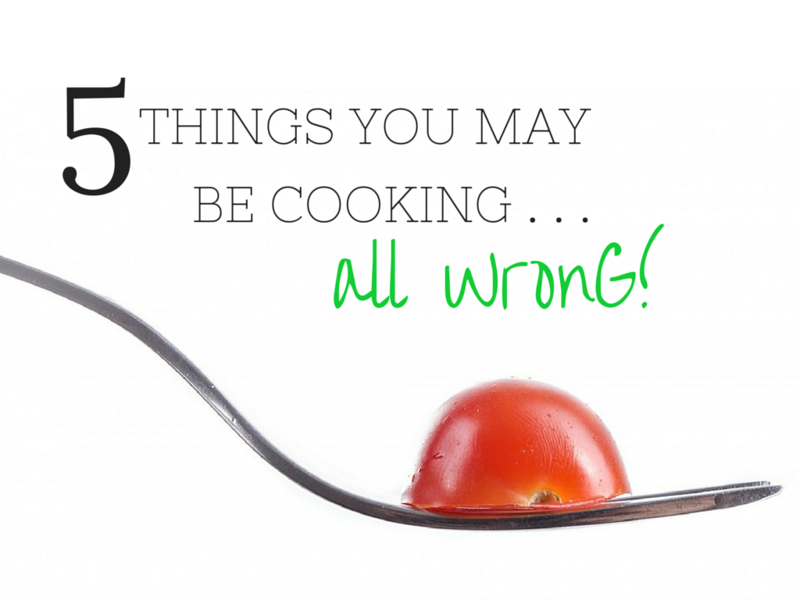 When I read the title, I thought to myself, hmmmm, just 5 things I'm cooking wrong? Make it 100! Ha. Seriously, great post. I need to remind myself that it's not just about eating healthy foods but how I prepare them. My mom is always on me for "burning" my garlic on high heat and ingesting, she's like cancer laura cancer, hello! Thanks for reminding me to eat more red onions too! True, burned garlic is not good! Mom always knows best, huh? It's amazing how many people cook brocolli for too long. They are wasting all the nutrients! Yes, and broccoli tastes far superior raw or cooked lightly, too!